Not to be confused with Sambava District. 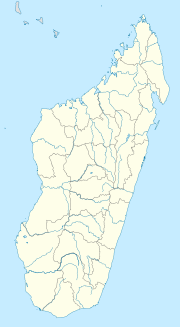 Sambava [samˈbav] is a city and commune (commune urbaine; Malagasy: kaominina) at the east coast of northern Madagascar. It is the capital of Sambava District and Sava Region. The population of the commune was estimated to be approximately 40,000 in 2001 commune census. Sambava is located on Route Nationale 5a Ambilobe - Antalaha. It has a local airport, regional airport. In addition to primary schooling the town offers secondary education at both junior and senior levels. The town provides access to hospital services to its citizens. Farming and raising livestock provides employment for 45% and 0.5% of the working population. The most important crop is vanilla, while other important products are coconut and rice. Industry and services provide employment for 0.5% and 53.5% of the population, respectively. Additionally fishing employs 0.5% of the population. Sambava disposes of white, sandy beaches with several hotels. The Marojejy National Park is close to Sambava on the road to Andapa. ^ a b c d "ILO census data". Cornell University. 2002. Retrieved 2008-02-23. ^ "Climate Statistics for Sambava, Madagascar (1961-1990)". Retrieved February 25, 2012. This page was last edited on 26 March 2017, at 23:32 (UTC).